So much of the abortion debate is based on myths, bad assumptions, bad logic, or outright gaslighting through deception. For the rest of 2019 we will highlight one common abortion myth every month. The Bottom Line: The Abortion Industry’s own researchers are forced to admit most late-term abortions are for elective reasons. 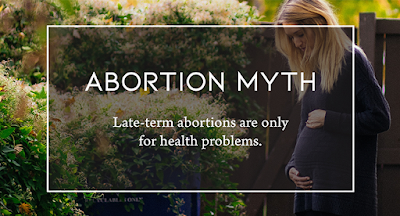 This myth is highly relevant given current debates over late-term abortion bans and legislation to protect children who survive botched abortions. The study only looked at late-term abortions involving children with disabilities; it did not look at all late-term abortions. That’s like claiming 100% of athletes are football players based on watching one football game. Did the journalist even read the brief summary of the study she referred to? Probably not. Also, why does she imply that abortion of children with disabilities is a “medical necessity”? Where does this laziness originate from? Probably because when late-term abortions are discussed in the media, typically members of the abortion industry are called on and they only talk about children diagnosed with disabilities or extreme medical problems. People who personally profit from abortion are not unbiased, and journalists and others shouldn’t treat their citation-free claims as the gospel truth. Notice the careful use of subjective language: "often." Often they might use the word "many." What do those words mean? There are more than 10,000 abortions every year in the United States after 20 weeks of pregnancy, is 10,000 "rare"? If 10,000 a year is "rare," can you say the smaller proportion of those due to disability can be called "many"? If only a small percentage of those late-term abortions are because of disability, can you describe that reason as "often"? The abortion industry doesn’t cite real statistics to back up their words. You also won’t see the truly informed members of the abortion industry using the term “most.” That’s because their own research shows most abortions after 20 weeks are done for elective reasons. While we can sympathize with the very real conflicts these women might be facing, the compassionate response is not to take the life of a child who can either survive outside of the womb or who is a week or two away from it. Those five reasons would never justify the infanticide of a preemie at the same age as a child in the womb facing abortion. A comprehensive study on the reasons women have late-term abortions may never be forthcoming. Only the abortion industry has reliable access to these women, and putting direct numbers to the issue that can be cited in legislatures and the media will harm their mission of supporting abortion. It’s not in their interest to share a personal story about a young woman who already has two children who decided to have a late-term abortion. Those purposefully spreading this myth are highly cynical, because they won’t condemn late-term abortions for elective reasons. If you proposed to Planned Parenthood that we should ban any late-term abortions that don’t involve a child with a disability, they will not agree. They support abortion for any reason and use people with disabilities as an excuse to distract people from their real intent. 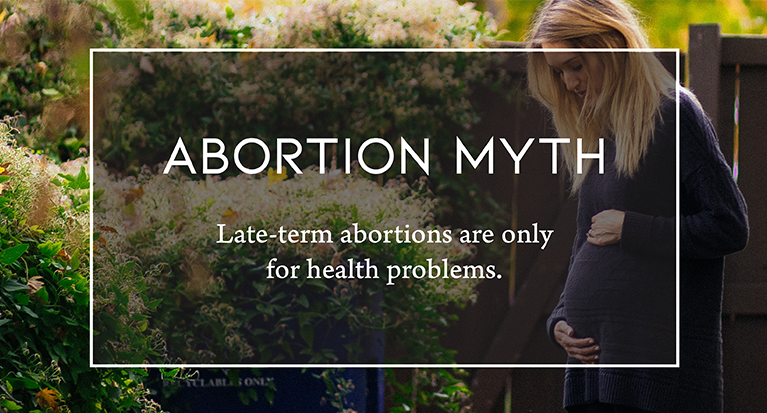 There's one remaining problem for the abortion industry with this myth. Let's accept it at face value. Let's also ignore the fact that a diagnosis of disability may be mistaken or a health problem may not be as profound as doctors predict. Polling shows a majority of Americans do not think abortion should be legal in the third trimester if the child has a mental disability or even a life-threatening medical condition.